Here I am again to do a product review on the dry bag I purchased from amazon.com I bought it over 6 months ago and I have been using it in every outdoor activity I engaged myself into. Same as before, I will be basing my review on seven (7) factors ; appearance, Packaging, Functionality, Durability or Quality, Convenience, Cost, Over-all Rating. 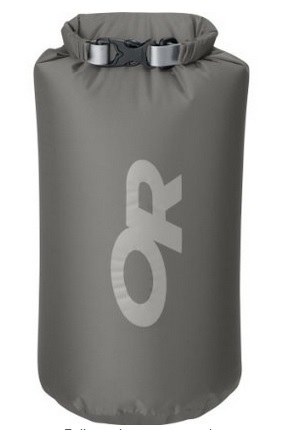 Outdoor Research Lightweight Dry Sack – Same as any other dry sack, it looks sturdy and very appealing to the eyes due to its gray color. The product logo is very visible which makes it more attractive. It was packed within a 9x2x1 inches box. It was very light and easy to carry. Won’t even cost a lot of space when you put it in your baggage. When I received it from Amazon, it was only inside a yellow envelope. As what the name suggest, it a very effective. It kept my important things dry when we had an overnight stay in Osmena Peak, you can read my article Osmena Peak : A Social Climb For a Weekend Trip, even when we went to a beach and put all my wet stuff in it. Read my article Unexpected Road Trip : Grandeur Beach – Lambug, Badian. No leaks, you don’t have to worry about your stuff getting wet. Once I abused it and filled it with different stuff, from chips to towels, spare clothes, gadgets and other beach necessities. The handle was great. It is very easy to use, easy to lock, easy to pack when you’re done using the bag. Cost-wise, I compare it to different brands with the same materials it was way cheaper compare to those. Same functionality but with less price. To wrap it up, I can say it was a good buy. It always serves its purpose. For over 6 months that I’ve been using it, it never failed me. Kept my gadgets and other stuff stay dry, even when it was exposed to water for over an hour. So what are you waiting for, if you’re an adventurous like me might as well but yourself your own Outdoor Research Lightweight Dry Sack. You can check out amazon.com for more product listing.